A new publication ‘Lemon Hart of Penzance’ by Keith Pearce has just been published. 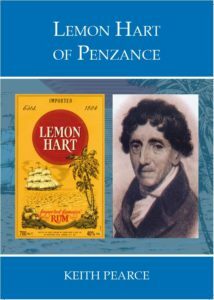 Lemon Hart (1768 – 1845) is the most well-known of the many Jews who lived in Cornwall in the late 18th and 19th centuries, and he is famous for the rum which still bears his name today. Over time, his story has been subject to embellishment and a colourful mythology has developed around him. This study attempts to separate fact from fiction and aims to give an accurate picture of this successful Cornish merchant, who moved to London in 1811. The text contains previously unpublished information on Lemon Hart and his family. Colour portraits and illustrations and five family trees. At present, the book is available from the publishers, Penlee House, Penzance at £5.00. If emailing or phoning to place an order, ask for the shop manager, Jo Inch.